It’s 2am. I’m leaning against a parking meter on a grungy, half lit street outside of a night club in San Francisco. The air around me is electric. I open one bleary eye to see the concerned and horrified faces of my friends. I put my hands up to my face and I can almost feel the thick purple sludge of the bruises under my fingers, somewhere people are still yelling and all of the pain jumps to life under my skin. I’m alive, that much is painfully obvious. It is January 6, 2008. I’ve just been hit over the head with a Patron Tequila bottle. As my bones gave way under the relentless force of that blow, some deeply held belief, some dark fear took root: I don’t deserve to be safe. We don’t often celebrate survival. We enjoy the story of the character that overcomes, they who rise above or move beyond some tragic set of circumstances to experience a more palatable version of success – but not just surviving. Before the conditions can be met to thrive, one has to be assured of their ability to survive. For thousands of transgender people around the world, survival is success. My story is not remarkable. For many of us, violence is inevitable. It is an unavoidable consequence of our choice to be true to ourselves. It’s not just the reaction that’s violent, it’s the process. It’s a startling realization at a young age that something isn’t quite right. It’s the silent tears streaming down the face of the adolescent child looking back at you through the mirror at a body you can’t make peace with. It’s the ball of knots in the pit of your stomach when you wake at 4 am and realize you’re going to have to face tomorrow with that same face you have today. It’s the first time your shoved walking down the hall and suddenly you know that whatever it is you can see, so can they. It’s the first time you ask yourself what’s wrong with you. It’s the last time you ask it thinking it might not be true and finally accept that you are what’s wrong. It’s the insidious, thick web of thoughts that infest your mind and you find yourself consumed with self-doubt, hate, shame and fear. You have to survive. The idea is that it gets better, but really you get better. Somewhere along the way you either become strong enough to be true to yourself at all costs, or you don’t. You either face the pain and choose to live free, or you don’t. You either make a choice to follow that unique soul song inside of you against all odds and all notions about what you should or shouldn’t be – or you don’t. And when you’ve finally wrestled with the internal aggression then you’ve got to face the world. The violence that transgender people face doesn’t stop at our skin, in either direction. There is an internal battle that rages alongside the external war for dignity and respect. It is an epidemic of fear and misunderstanding that costs so many transgender people their quality of life, if not their physical essence. Even at a time of more mobility, more visibility and more possibility than any other generation of transgender lives, very few come through this journey unscathed. And so we remember. Any culture that seeks to thrive must know and celebrate its history, so we choose to remember. Today, as we pause for Transgender Day of Rememberance, we honor the lives lost, more often than not, to brutal and degrading violence. For every name we read, we know there are hundreds we’ll never know. Thousands of names that have passed without recognition, without celebration, but with no less dignity. To those we’ve lost, by any means, we honor you today. To our brilliant advocates and activists who have stood on the front lines and shouldered the blows, we celebrate you. Thank you for your courage, your bravery, and your vision. 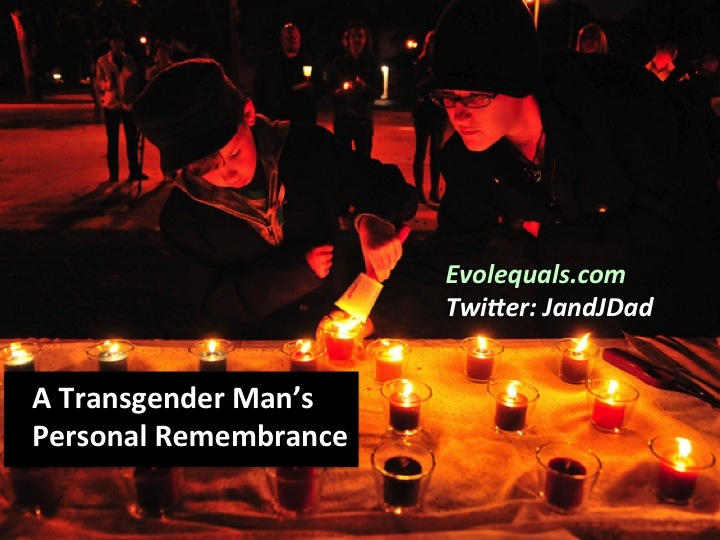 Until now, Transgender Day of Remembrance has been a solemn and sobering day of acknowledgement. Until now, we’ve had to endure stories of pain, heartache, loss and shame. Until now, until this generation, we’ve been a people who’ve struggled to survive amidst a vitriolic storm of misinformation and fear. Until now, when our social media feeds are flooded with stories of young children who claim themselves as whole at a young age and whose parents provide them with support. Until now, when we enter a grocery store and see Laverne Cox on the cover of TIME Magazine. Until now, when anyone, anywhere can open YoutTube and watch the journeys of hundreds of people making their transitions publicly, ask any question imaginable and find people just like them a few keystrokes away. The narrative of our bodies has begun to evolve to include our humanity and provide us with dignity in a way that has not been possible at other times in history. The names, which are often read aloud at remembrance vigils, are often the only time these deaths will be acknowledged and the list is overwhelmingly populated by transgender women of color. Among transgender people, violence is an almost certain condition. Until now. Our bodies are beautiful. They are complicated and unique. Our stories are powerful and profound. They deserve to be heard, to be seen and to be celebrated. Today, we remember those we’ve lost and I’d like to challenge us to celebrate those we have. Transgender bodies can offer us a window in to what is possible when we dare to break free from limited beliefs about biology and cultural constructs. They teach us about the strength of the human spirit when it refuses to be bound by what has been and has the courage to embody what can be. Our experiences may be unique, but our lessons are universal: Every body deserves to live Free. Until now, we’ve had to fight to survive. Today, we remember to Thrive. Please like the evoL= Facebook page here. This entry was posted in Civil Rights, Equality, Hatred, Living, Prejudice and tagged human dignity, lex beatty, lex is word, lgbt, mugging, suicidal, TDOR, TDOR2014, trans male, transgender. Bookmark the permalink.